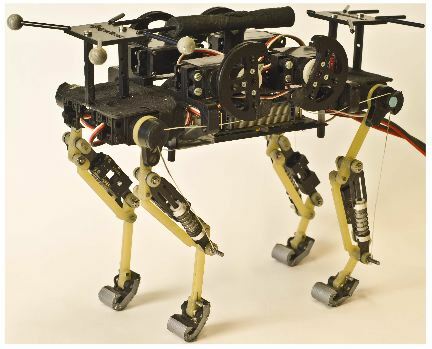 Thanks to its cat-modeled legs, EPFL’s four-legged “cheetah-cub robot” is small, light and the fastest in its category (small quadruped robots under 30Kg): it can run 5 kilometers per hour (3.1 mph) — nearly seven times its body length in one second. . Developed by EPFL’s Biorobotics Laboratory (Biorob), biomechanics, the robot will serve as a platform for research in locomotion and biomechanics. Robots developed from this concept could eventually be used in search and rescue missions or for exploration. Although not as agile as a real cat, it still has excellent auto-stabilization characteristics when running at full speed or over a course that included disturbances such as small steps. It’s also extremely light, compact, and robust and can be easily assembled from materials that are inexpensive and readily available. The design is based on the meticulous observation and faithful reproduction of the feline leg. The size of a domestic cat, the number of segments — three on each leg — and their proportions are the same as they are on a cat. Springs are used to reproduce tendons, and actuators — small motors that convert energy into movement — are used to replace the muscles. “This morphology gives the robot the mechanical properties from which cats benefit … a marked running ability and elasticity in the right spots, to ensure stability,” explains Alexander Sprowitz, a Biorob scientist.